Winter in Minnesota gets cold. Really?! You don't say! Even with an insulated bottle, and a splash of whiskey, my water bottles continued to freeze on anything but really short rides. 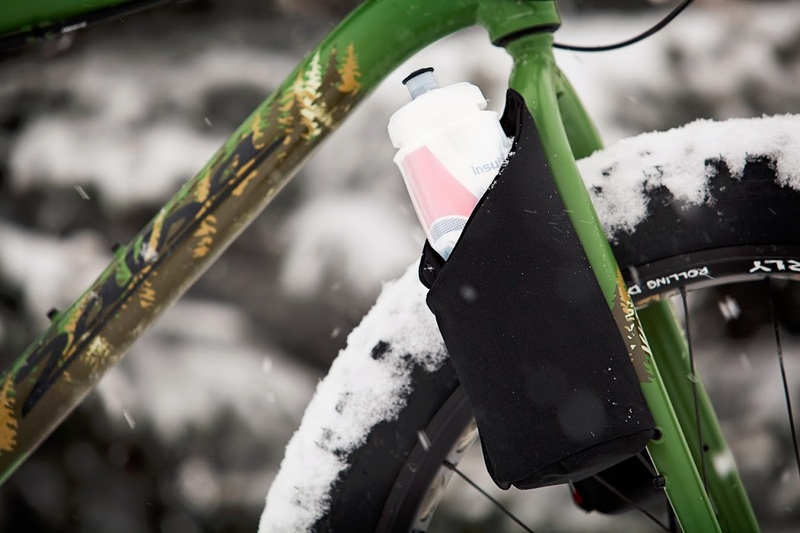 With a bottle coozie that went around the cage, the bottle can still be easily grabbed while riding, but the added insulation slows the freezing process significantly. This is what you want; drinkable liquid instead of hauling around a block of ice. Again, winter in Minnesota is cold. 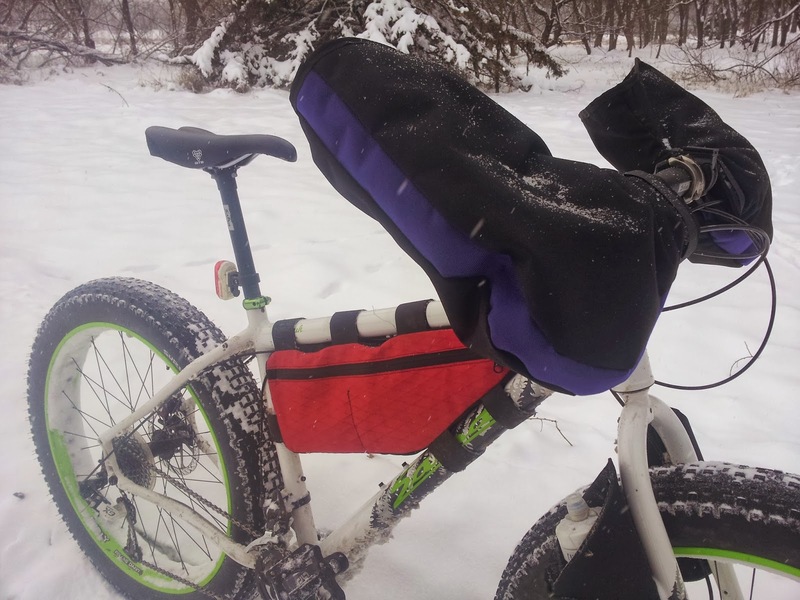 Pogies keep your hands warm but don't require you to wear huge mittens as the temperatures drop, allowing you to keep dexterity for handlebar control as well as when accessing food/water/etc. Wearing a backpack on a long bike ride just doesn't make sense. A bag on your back when riding to school with a bunch of books -- sure. Messenger bag if you're a messenger -- absolutely. But, when riding for hours, a bag on your back gets sweaty, gets uncomfortable, isn't accessible and is just plain a pain. The contents at the top of a frame bag can be accessed when riding. 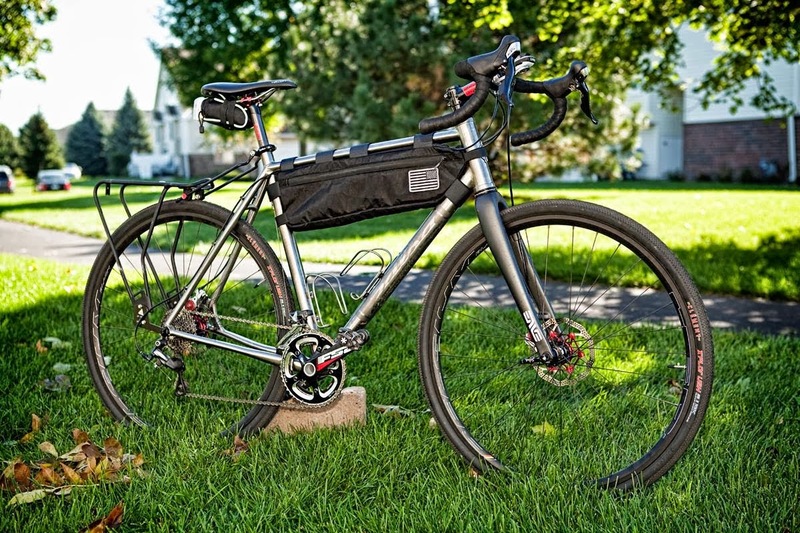 A frame bag keeps the weight centered in the bike for better handling compared to a rack and pannier setup. Fill the bag with clothes. Fill it with food. Put a water bladder in it. Personally I use either a full frame bag with a hydration bladder inside or a half bag that still allows the use of water bottle cages. Both ways are great; bag choice depends on the ride that day. I started making frame bags for myself because I couldn't get what I wanted in stores, plus I knew I could make what I wanted and needed. I can make you one too. Drop me an email and let's talk.